Chad Pipkens in his Douglas J-wrapped boat with a big largemouth bass caught during 2013 practice at Falcon Lake. Win a fishing day with Chad. 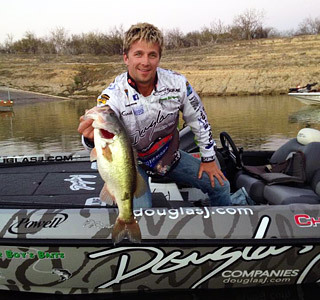 Professional bass fisherman Chad Pipkens is teaming up with Douglas J for a charity Couples Sport Raffle to benefit JDRF – the leader in the search to end type 1 diabetes (T1D) for more than 40 years through research funding and advocacy. There will be one (1) big winner in this limited raffle drawn this Friday, August 16, 2013 at noon so don’t delay! Buy your tickets now! Chad Pipkens says, “Awesome cause that I am a part of that could use your help!! Before this Friday at noon! !” He asks and thanks you for your continued generous support of the charity causes he is involved with. You can win a day of fishing with Chad and the other great prizes below! The drawing for the charity raffle winner will take place at 12pm this Friday, August 16, 2013 at Douglas J Aveda Institute in East Lansing, Michigan. Go to DouglasJ.com/JDRF now to enter this Couples Sport Raffle, or call 877-334-8657. Tickets are $35.00 each. By helping Chad Pipkens with the great cause of JDRF and T1D you are a winner! You do not need to be present to win. Total tickets sold is 200. *Minimum of 50 tickets will be sold or raffle will revert to a 50/50 cash drawing. All donations are tax deductible. Proceeds to benefit the JDRF (formerly Juvenile Diabetes Research Foundation). Raffle license # R22784. « Pipkens Bags First Top Ten Elite Series Finish!